USS Ward (DD-139) has two connections to Japan's Special Attack Forces. First, Ward fired America's first shot of WWII and sank one of the five Japanese midget submarines trying to enter Pearl Harbor during the morning of December 7, 1941. Second, exactly three years later on December 7, 1944, a kamikaze aircraft hit Ward in Ormoc Bay in the Philippines, and the burning ship was later intentionally sunk by gunfire from a US destroyer. This paperback tells the history of this famous ship along with many photographs, artist's renderings of the ship including one on the front cover, and drawings of Ward as a destroyer (DD-139) and as an armed personnel transport (APD-16) after being converted in February 1943. 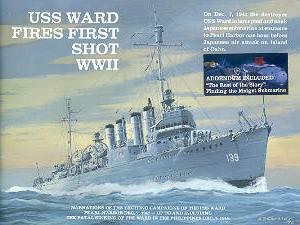 The title on the cover (USS Ward Fires First Shot WWII) inexplicably differs from the title given on the inside cover and the book's first page (USS Ward—The First Shot). The history appears that it will end on page 36 with Ward's sinking after being hit by a kamikaze plane, but surprisingly the narrative goes back to 1942 and then again goes forward for another ten pages with a more detailed account of the kamikaze attack at the end of this section. This must have been how the two authors put together their separate work on the destroyer's history. Arnold S. Lott, a Lt. Commander in the US Navy, has authored several books about various ships including Brave Ship Brave Men (1964) about destroyer minelayer USS Aaron Ward (DM-34), which suffered hits from six kamikaze planes on May 3, 1945. Robert F. Sumrall, retired as Assistant Director and Curator of Ship Models at the US Naval Academy Museum after 36 years, also wrote many books about US Navy ships including USS Kidd (DD-661) (2002) and USS Laffey (DD-724) (2001), which both got damaged in kamikaze attacks during the Battle of Okinawa and now serve as museum ships. Ward's history has several interesting facts. When the destroyer was reactivated in early 1941 after being decommissioned for 20 years, 85 reservists from St. Paul, Minnesota, became part of the crew. Ward's No. 3 gun, which hit the Japanese midget submarine in its conning tower, now stands on the grounds of the Minnesota State Capitol in St. Paul. The famous gun was removed when Ward was converted to an armed personnel transport in early 1943, so after the war's end Ward veterans worked to bring the gun to their home in Minnesota. Since so many Ward veterans were from the same city, they met in February 1947, shortly after the war's end, to organize the First Shot Naval Vets, which supported publication of this book. Another interesting fact is that William Outerbridge, captain of Ward when she sank the Japanese midget submarine outside the entrance to Pearl Harbor, was the same person who as captain of the destroyer O'Brien (DD-725) was given the order to sink the ship he had first commanded after it became clear that she could not be saved from fires burning aboard from the kamikaze crash. Outerbridge left Ward in September 1942 for another assignment, and he became captain of the destroyer O'Brien in June 1944. On March 26, 1945, Outerbridge's ship O'Brien was hit by a kamikaze aircraft that killed 50 and wounded 76. In contrast to the tragedy on O'Brien, Ward luckily did not lose a single man in the crash of the kamikaze plane that sank the ship. A four-page insert at the end of the book describes the discovery in August 2002 of the midget submarine that was sunk by two shots and four depth charges from the destroyer Ward. The hole found in the conning tower of the sunken submarine confirmed the story of Ward crewmen that they had hit the conning tower with a shot from the No. 3 gun. Several documentaries were made related to the finding of this midget submarine, such as War Stories with Oliver North: Attack of the Japanese Midget Subs!, which included an interview with former Ward crewman Ken Swedburg. 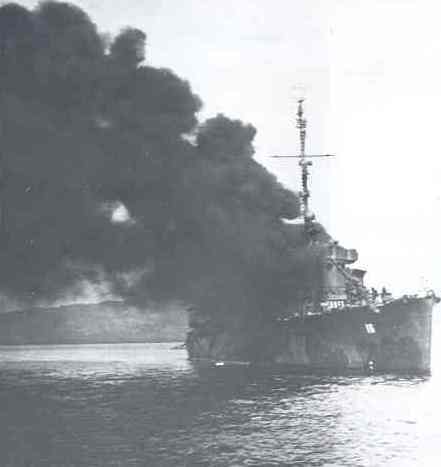 The book's section on the kamikaze attack and Ward's sinking has four photos that show heavy smoke pouring from the destroyer after the crash (see one photo below). This section, and indeed the entire book, would have been greatly improved if firsthand accounts from former crewmen had been included. Even with no personal stories from crewmen, the many photographs throughout the book enhance the history of the destroyer. For example, the book contains numerous photographs of Ward's building in 1918 in a record time of 17 and a half days from laying the keel to being ready to launch.